Echium fastuosum- Echium fastuosum, or Echium candicans, is also known as pride of Madeira, being native to Madeira and is part of the Boraginaceae family. Echium fastuosum is big, bold and beautiful. This half-hardy biennial is a showy, evergreen, perennial plant that can reach up to 5 - 8 ft tall and 6-10 feet wide. It is a large picturesque plant with coarse heavy branches and an excellent foliage plant. Spike like clusters of bluish purple flowers standout above the foliage in the spring. 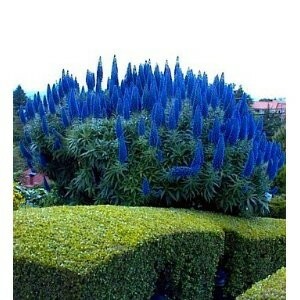 Use Echium against walls and at the back of flower borders or on slopes for a dramatic effect. Pride of Madeira makes a bold addition to any xeric landscape because it is very drought tolerant. The striking blooms make it attractive to bees, butterflies and/or birds. Once Pride of Madeira has completed its flowering, it leaves only the green spires that should be removed and the entire plant cut back hard before winter. Hardiness zones : Zones 9-11 Echium fastuosum is a stunning sun lover for coastal windy gardens, that can withstand negative temperatures down to 26°F (-3°C). Note that the leaves and the stems may prove slightly skin irritant, so handle them with care. This Echium requires a well-drained ground and is quite happy where soils are dry and poor. Light pruning will keep Pride of Madeira bushy. Cut off flower spikes as they fade in order to promote newer growth. If you choose not to remove the spent flowers, the life span of the plant will be shortened. However, Echium will reseed, producing a flush of fresh new plants. Little or no water is required in mild-summer climates and only weekly watering is required in hotter areas.